•	If you don’t act now the offer won’t be good after today. •	You have won a free gift or vacation but you have to pay “postage and handling”. •	We have money for you, but you need to pay the courier. •	Don’t buy anything of the phone from a company or person you are not familiar with. •	Always request written material regarding any offer. •	Obtain salesperson’s name and contact information. •	Check out companies with the BBB, State Attorney General and the National Fraud Center to see if these are legitimate. •	Never pay in advance for services. •	Take time before making any type of financial decision, including asking the question what guarantee do I really have that this product or service will happen. •	Never give personal information on out on a phone call. •	Consider putting yourself on the Do Not Call list, this will reduce and or eliminate unsolicited calls. 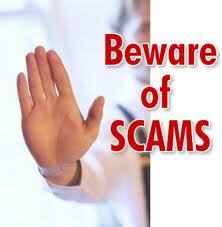 •	If you become a victim of fraud, contact and report it to the local, state and or federal law enforcement agencies. •	Do not reply to any letter from Nigeria that asks you to send personal or banking information. Contact the US Secret Service, US Postal Inspection Service or the local FBI office. •	Do not believe the promise of large sums of money for your cooperation. •	Never give your personal account information. •	Be skeptical about any persons representing the Nigerian or any foreign government who asking for your help in moving money out of their country. If the offer of an "opportunity" appears too good to be true, it probably is. Follow common business practice. For example, legitimate business is rarely conducted in cash on a street corner. •	Know who you are dealing with. If you have not heard of a person or company that you intend to do business with, learn more about them. Depending on the amount of money that you plan on spending, you may want to visit the business location, check with the Better Business Bureau, or consult with your bank, an attorney, or the police. •	Make sure you fully understand any business agreement that you enter into. If the terms are complex, have them reviewed by a competent attorney. •	Be wary of businesses that operate out of post office boxes or mail drops and do not have a street address. Also be suspicious when dealing with persons who do not have a direct telephone line and who are never in when you call, but always return your call later. •	Be wary of business deals that require you to sign nondisclosure or non-circumvention agreements that are designed to prevent you from independently verifying the bona fides of the people with whom you intend to do business. Con artists often use non-circumvention agreements to threaten their victims with civil suit if they report their losses to law enforcement. •	Never sign blank insurance claim forms. •	Never give blanket authorization to a medical provider to bill for services rendered. •	Ask your medical providers what they will charge and what you will be expected to pay out-of-pocket. •	Carefully review your insurer's explanation of the benefits statement. Call your insurer and provider if you have questions. •	Do not do business with door-to-door or telephone salespeople who tell you that services of medical equipment are free. •	Give your insurance/Medicare identification only to those who have provided you with medical services. •	Keep accurate records of all health care appointments. •	Know if your physician ordered equipment for you. •	Be wary of individuals or groups selling kits that they claim will inform you on to access secret bank accounts. •	Be wary of individuals or groups proclaiming that paying federal and/or state income tax is not necessary. •	Do not believe that the U.S. Treasury controls bank accounts for all citizens. •	Be skeptical of individuals advocating that speeding tickets, summons, bills, tax notifications, or similar documents can be resolved by writing “acceptance for value” on them. •	If you know of anyone advocating the use of property liens to coerce acceptance of this scheme, contact your local FBI office. •	If an "opportunity" appears too good to be true, it probably is. •	Do not invest in anything unless you understand the deal. Con artists rely on complex transactions and faulty logic to "explain" fraudulent investment schemes. •	Do not invest or attempt to "purchase" a "letter of credit." Such investments simply do not exist. •	Be wary of any investment that offers the promise of extremely high yields. •	Independently verify the terms of any investment that you intend to make, including the parties involved and the nature of the investment. •	Think before you invest in anything. Be wary of an investment in any scheme, referred to as a "roll program," that offers unusually high yields by buying and selling anything issued by "prime banks." •	As with any investment, perform due diligence. Independently verify the identity of the people involved, the veracity of the deal, and the existence of the security in which you plan to invest. •	Be wary of business deals that require non-disclosure or non-circumvention agreements that are designed to prevent you from independently verifying information about the investment. •	Be careful of any investment opportunity that makes exaggerated earnings claims. •	Exercise due diligence in selecting investments and the people with whom you invest—in other words, do your homework. •	Consult an unbiased third party—like an unconnected broker or licensed financial advisor—before investing. •	Be wary of "opportunities" to invest your money in franchises or investments that require you to bring in subsequent investors to increase your profit or recoup your initial investment. •	Independently verify the legitimacy of any franchise or investment before you invest. •	Don't believe the hype. •	Find out where the stock trades. •	Beware of high-pressure pitches.